Review the requirements before you install and use Integrity Monitor. If you are using an older version, please contact your Technical Account Manager (TAM) before installing and using Integrity Monitor. Tanium Client The event recorder is supported on the same Linux endpoints as the Tanium Client and on endpoints with Windows NT 6.1 (Windows 7 / Windows Server 2008 R2) or newer. For more information about specific Tanium Client versions, see Client host system requirements. Integrity Monitor does not use the recorder for Solaris and AIX. For more information about deploying the Tanium Client to endpoints with different operating systems, see the Client Deployment Guide. Tanium Index 1.6.0 or later is required for monitoring endpoints with Windows NT 6.0 (Windows Server 2008 / Windows Vista) or older. On endpoints with Windows versions 6.1 and newer (such as Windows 7 and Windows Server 2008 R2), Integrity Monitor does not use Index. The installation of any version of Index does not affect Integrity Monitor. Each endpoint device must have a minimum of 100 MB RAM. By default, the endpoint database is 1 GB in size. There must be 2 times the maximum database size available in free disk space on the partition where the Tanium Client is installed. The CPU demand on the endpoint averages less than 1%. Install the audit daemon and audispd plugins before deploying Integrity Monitor tools. The minimum compatible version of auditd is 1.8; however, for the best results, use the most recent stable version. See the specific operating system documentation for instructions. Be aware that the recorder appends its own rules to the end of the existing audit rules. If the existing audit system is in an immutable mode, using the -e 2 flag, the recorder on Linux is not supported. Specific processes are needed to run Integrity Monitor. If you use security software in your environment to monitor and block unknown host system processes, your security administrator must create exclusions to allow the Tanium processes to run without interference. The Integrity Monitor service account requires certain privileges to run background jobs which include gathering endpoint statistics, sending labels to Connect, and evaluating rules. See Installing Integrity Monitor to create a service account user and configure the service account within Integrity Monitor. Can create watchlists and create, deploy, and view results for monitors. Integrity Monitor 1.2.1 introduces role-based access control (RBAC) permissions that control access to Integrity Monitor functions. The four predefined roles are Integrity Monitor Admin, Integrity Monitor Author, Integrity Monitor User, and Integrity Monitor Read Only User. View the Integrity Monitor workbench. View monitors. View and download reports. View general settings, templates, and default labels. Create and edit monitor event labels and label notes. Enable, disable, or delete reports for a monitor. Update general settings, templates, and default labels. Delete monitor event labels and notes. Execute tasks in the IM service via the IM schedule plug-in, including sending labeled events to Connect via a background scheduled task and scheduling the weekly day and time to generate reports. Execute and apply rules to events. Create, check the status of, and download the troubleshooting archive. 1 Denotes a provided permission. 2To send labeled events to Tanium Connect, you must have Connect installed. You must also have the Integrity Monitor Monitor Event Labels Write permission and the Tanium Connect Connect Event Write permission, which is provided through the Connect roles. The lowest privileged Connect role that an Administrator can assign to grant this privilege is Connect User. Endpoints are considered to be legacy if they are using Windows versions older than 6.1, such as Windows XP, Windows Server 2008, or older. Windows Server 2008 R2 is not considered legacy. See Microsoft Windows Operating System Version for more information. You must use Index 1.6.0 or higher. Index must be started separately. Integrity Monitor only deploys Index. Index must have finished its initial scan. To monitor permission event types, there are no special requirements for Linux endpoints. To monitor permission event types for Windows versions 6.1 and newer, you must configure the Audit File System permission under Local Security Policy on the endpoint. The following steps to configure the Audit File System permission might slightly vary depending on your exact version of Windows. Open Local Security Policy, usually found in the Administrative Tools folder. 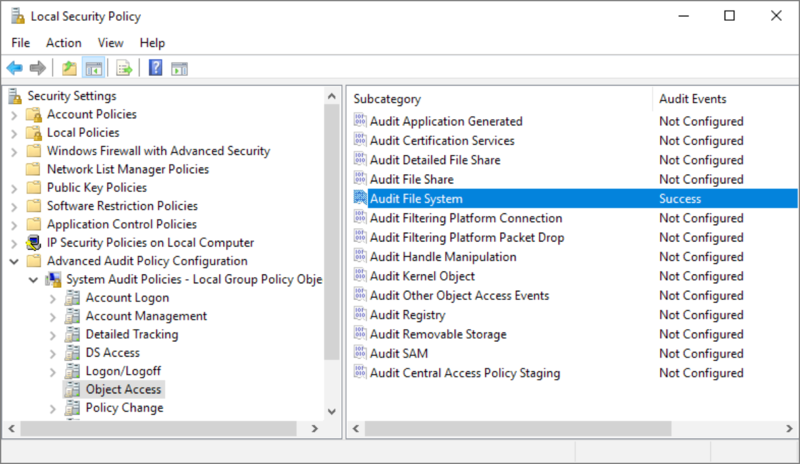 Expand Advanced Audit Policy Configuration under Security Settings. Expand System Audit Policies - Local Group Policy Object. Double click Audit File System. Select Configure the following audit events: and then select Success. By default, Integrity Monitor monitors permission event types for Windows versions 6.0 and older. Consult with your TAM if you choose to override this setting.